Hayley's Paper Garden: Feeling the Love! This week we are being sponsored by talented Designers over at DSR Designs. You should really pop over and check out the fabulous images they have to share. We always have so much fun working with their delightful digitals! DRS Designs - a family owned company since 1950 - boasts hundreds of original rubber stamp designs. All images are available fully mounted, completely unmounted or mounted on cling cushion and are proudly hand crafted in the USA. Our rubber stamp collection includes a wide assortment of images including sentiments for all occasions, easy background designs and fun technique stamps such as our stained glass and plaid designs. Now onto the task at hand... I have created a Valentine Card which I am going to print and have each of my kiddos colour before we send them out to family back home! Great post Haley. I love your image! Absolutely darling Valentine card, Hayley! I love how you stamped the sentiment, and left the images for coloring! So clever! 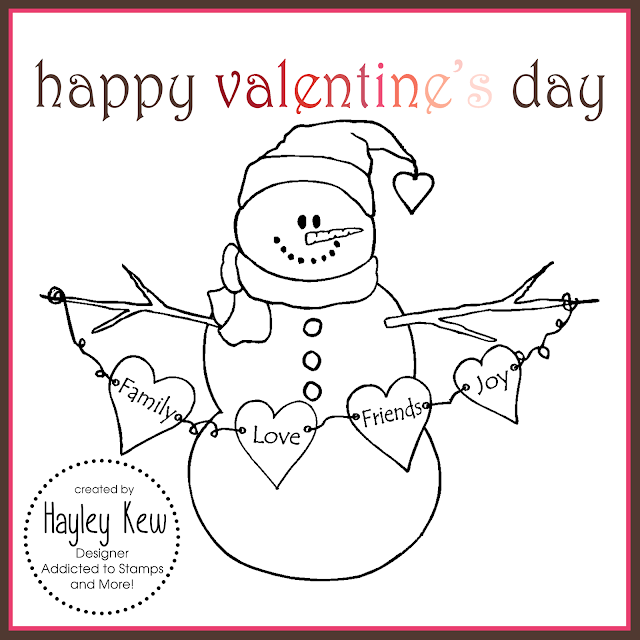 Excellent idea to give your kiddos a chance to personalize their Valentine cards! That snowman is seriously adorable!